The Alan T Brown Foundation (ATBF) has served the spinal cord community for over 28 years and is dedicated to improving the quality of life for people living with paralysis. ATBF provides information, resource referrals and peer support to paralyzed individuals and their families. ATBF strives to assist individuals in achieving the highest personal level of independence, sustaining a healthy lifestyle, managing daily and chronic health issues, and adjusting to their new life after paralysis. 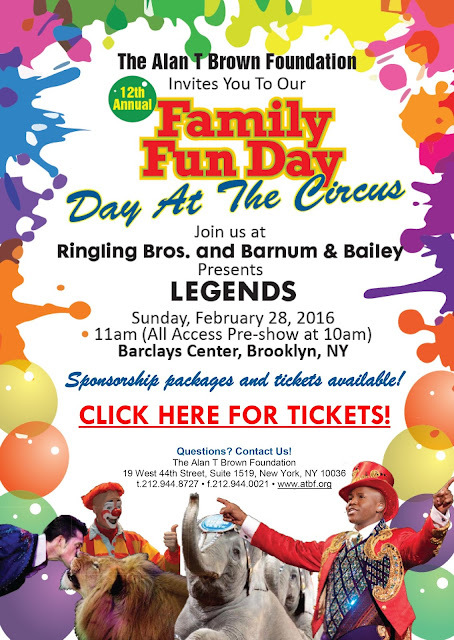 This year, the Alan T Brown Foundation will be holding its Annual Family Fun Day at the Ringling Bros. and Barnum Bailey Circus at the Barclays Center on Sunday, February 28th. This event will benefit the Foundation’s extensive outreach initiatives and the programs they support at hospitals and rehabilitation centers in the Tri-State area. Please click here to purchase your tickets or make your donation to this very worthy cause.